Another target in the Ashland corridor, in the Back of the Yards community, was the small yet well known tax office, AMERI-MEX Insurance Agency, positioned on the 46th st. corner for some 30 years . This was an important job in a way because of its simplicity, which was a change from the detailed high color art works we’ve done over the last several years. For 30 years it looked this way. The times are tough and we needed to diversify. Signage work was added to the services that were offered. It extended our range and, well produced more opportunities for work. The professional artist ponders this issue regularly when you have a studio and assistants to maintain. A pleasant, yet savvy Ms Fonseca, director of the service at AMERI-MEX finally settled on a price she was pleased with and the work was then produced in 2 weeks. From a commercial point of view, it was a good direction forward. The struggle continues for more recognition and opportunity. How important is it for an artist to engage a neighborhood? VERY important it seems. Art has no true spirit if its aim is to stay indoors and affect only a specific audience. Even the poor and struggling need to feel a sense of hope and know that people are out there who care to say a positive statement. Located at 46th and Ashland Ave.
Aronson Furniture store had been a center for active business many years ago, however as time went on, the store fell into bankruptcy and closed. This shell of an institution stood for more than 10 years in the face of Ashland Ave. traffic, day in and day out, vacant and lifeless. 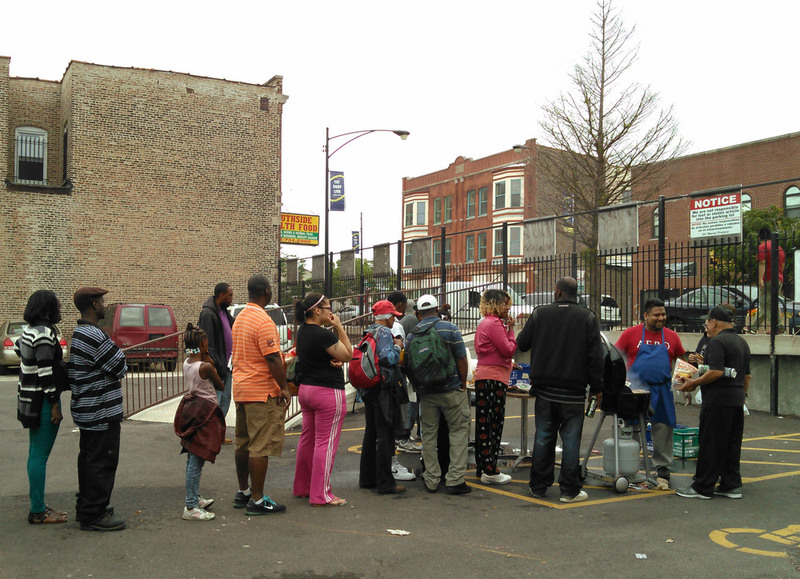 It’s presence was a reminder of the struggle that plagued the Back of the Yards community for some time. At this point, we discussed this issue with the Neighborhood Council, who then made reference to the owner of organization that held rights to the property. Enter T.R.P., The Resurrection Project, a non for profit organzation that is buying and re-envisioning properties and buildings in the area. We contacted the liaison representative, Oscar Hernandez, of our intentions. He was interested in the concept of doing an art gallery display on the front of the property. A few weeks passed, and in April the budget was approved, and the project was underway. Luz Castillo, co-lead at Cocomocha studio, largely responsible for the design, stated: “This is a good thing for my community; a way to revitalize a neighborhood that really needed a change visually. I felt good to be able to do this." The installation is available to see for the summer of 2016, after which it is proposed, the building will be dismantled for a new center in the works. Response from the community and even businesses in the area were quite welcoming. It's with a great sense of accomplishment that we recap Cocomocha's successful installation of it's first floating mural for Macias Produce. The production of this mural was an ambitious project. With months in the making, the pieces left the colorful walls of Cocomocha's studio. They were carefully wrapped and delivered to their new home. On Thursday, July 16th, 2015 Cocomocha's crew met at Macias Produce. The empty canvas awaited. The parking lot of Macias Produce was our playground for the day. We battled the rain that poured throughout the day. Ladders, drills, hammers and eye measurements were our instruments for the orchestrated plan. The clouds spared us a few hours, and that was when the magic happened. Tony Macias Jr. arrived with a grill in hand and a smile as big as the mural! He was ready to start the cookout in celebration of the great installation that awaited. Soon enough burgers and hotdogs were sizzling away (300 of each to be exact) perfuming the parking lot and attracting people over. The response of the community was amazing! So many people from all walks of life came over. They peeked at our work, curiously watching as the art pieces were arranged. The line for the food was endless. A neighbor blasted music from his car. It was a party! A celebration of art, of community, of togetherness, of people sharing something so small, but so genuinely kind that it was just so immense. When I saw everyone lined up, laughing, talking, hugging and waiting for food, a thought came to mind, "People, no matter their life circumstances, are always drawn to love, togetherness and compassion." The installation that was planned for six hours, turned into 3 days. On Saturday, July 18 at 8pm, the mural, gloriously high up in its place, was awaiting to be revealed. The moment we had anticipated was finally here. Months and countless hours of work were finished and the majestic floating mural illuminated the entire parking lot. Cocomocha would like to thank everyone at Macias Produce for trusting us with their business facade and for their generosity to the community. We are excited for the projects ahead. We thank our supporters and the entire Cocomocha crew for helping on site and cheering us on through social media! We would love to hear your comments! Please share our blog and like our Facebook page. Amigos, we want to thank you for all the support to our DriveByArt initiatives. We had a great kick-off event followed by a successful installation of the art work for Las Artelitas with the help of our contributing artists. Las Artelitas is a creative collective in the Little Village Community. Above from left to right: Luz Maria Castillo, Nakesha Walker, Derric Clemmons, Frank Diaz, Dameon Gray and Mary Lumbreras. From left to right: Amara Betty Martin, Jenese Jackson, Erica Sanchez, Sara Cortez, Rosa Rodriguez and Jhonatan Carbonell. Our next move is the installation of our first floating mural for Macias Produce. This has been a work in progress for the past few months. We are pleased to reveal this great work of art to the Chicago Southeast Side Community. We are thankful to the Macias family for trusting us with their business. The anticipated date for installation is Thursday, July 16th, 2015. We are excited for the projects ahead! Looking forward to conclude our pending projects, and motivated to start the new ones! Time is unapologetic. It's been almost a month since we lost Rudy. Time has swept through the pain, almost covering our memories with layers of countless, endless life routines and the normalities of daily to-dos. The streets of our community are buzzing as loud as usual, the cafe brewed the same coffee, and the bar played the same old Blues. But make no mistake. Some nights are darker, the air a little colder, and some days the sky is not as bright. For those who knew Rudy, these summer nights are a lot less sweeter. 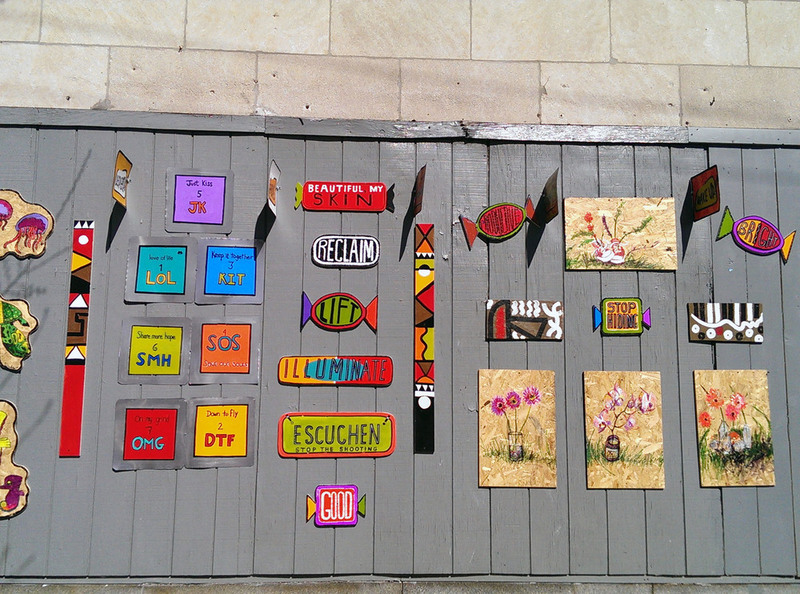 Cocomocha paid tribute to his memory by creating small tokens of his life like "the mighty lady bug," and birds and flags carrying messages of hope, love, and colorful words of inspiration. For everyone who knew Rudy, we hope that the art will make you smile a little bigger, and surely something you see will take you back in time, if for just a second, to that place of joy, music and his presence. Those who didn't know Rudy, and for the entire community, this art signifies the beauty that will forever remain to reminds us that "those we love can never be more than a thought away, for as long as there's a memory they are in our hearts to stay." You can check out our tribute at Simone's Bar in Pilsen. About a week ago, we received the news of yet another senseless murder in the Pilsen community. We soon found out that Rudy Avina, a well known member of the Pilsen community, was the victim. This news broke the hearts of many who knew Rudy. The Facebook page "Remembering Rudy" was created in his memory. There, the sentiment among those who wrote about him, was the same. The community lost a great soul; a being who "loved so genuinely, loved so intensely and found a million ways to share his love with all of us." As a community, friends and family dealt with the confusion, despair and sadness of loosing Rudy, hope, love and togetherness quickly became the way to remember him. Our theme: "For all the ugly in the world, there still some beautiful: Remembering Rudy"
This quote comes from Mia Avina, Rudy's daughter, who shared this on the Facebook Page (Remembering Rudy) dedicated to her father. Simone's Bar will kindly lend their facade so that together with a few other Chicago artists, we can create patterns and words that represent and honor Rudy. We hope to be able to remind our community and anyone who drives by that love isn't provoked, and that even in the darkest of times, love still prevails. It gives us strength to put one foot forward when all circumstances would have us burried in darkness of our sorrow. Love really is everything that moves us and if we open up our hearts, to remember anyone we've lost, with and through love, we can truly rise above the pain and our loved ones will never be lost or forgotten. Our #drivebyart initiative, meant to create awareness and togetherness, may not change our communities. But if one person is touched, moved, motivated, and inspired by a single word, a color, a pattern, then our art will never end. We will paint the town in hopes to bring us closer to that love which isn't provoked; that love which connects us beyond our flesh, and we will do so one color at a time. 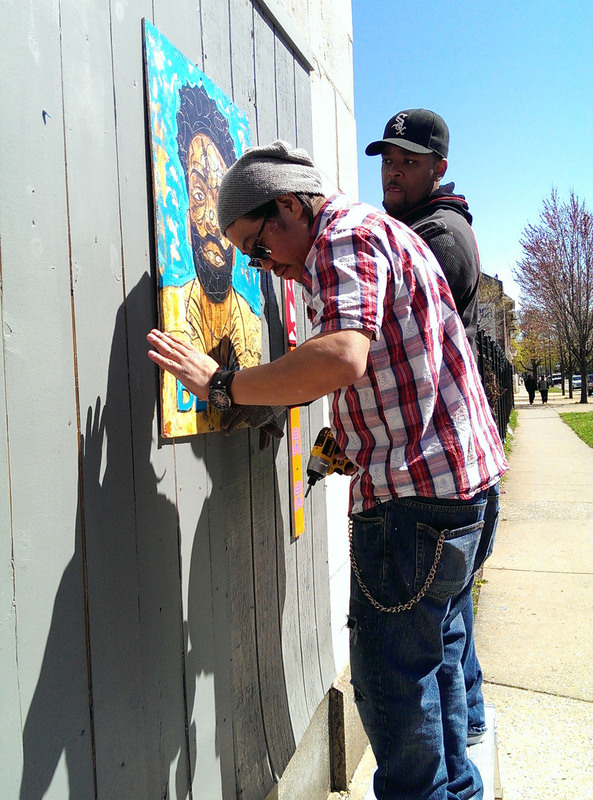 Sunday, April 26th 2015, was the culmination of our first #drivebyart installation. After our kickoff event last Friday, Cocomocha was ready to splash the streets with color. 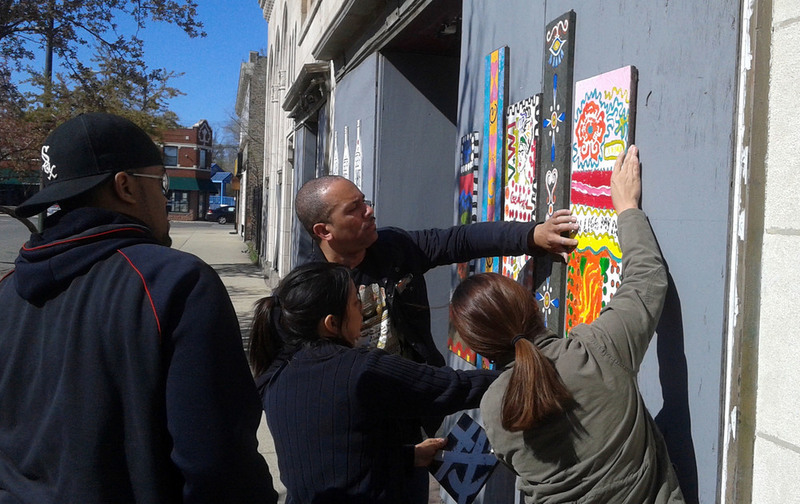 With a van full of art, the entourage arrived at 78th & Exchange, a Chicago's Southeast side neighborhood. What looked like an ordinary Sunday afternoon, quickly turned into a moment in time that drew bystanders and community members to walk up and admire what was happening. Our most challenged communities are suffering from violence, drugs and lack of resources. These issues turn into disruptive behaviors that end up causing trauma in everyone who's ever experienced them. Fear takes over and it becomes a brutal reality that subconsciously everyone learns to live with. The idea that things cannot and will not change becomes the daily mantra. Dodging bullets and hiding behind shades is the only reasonable thing to do. Violence is often seen as an issue of a specific neighborhood or culture, but in contrary, it spreads quickly and uncontrollably throughout entire cities. Location on 79th and Exchange, Chicago's Southeast Side. An image of community support...fun and satisfying. Cocomocha showed up with the purpose of impacting anyone who lives, works, plays walks and drives by the area. Our mission is to remind everyone that together we are stronger, that every single person deserves to walk by and feel safe. Many neighbors who walked by simply said, "This is great, God bless!" One person in particular walked by repeating, "I like! I like! I like"
Drive by Artists: (from left to right) Mynor Paredes, Andrea Paredes, Sandra Lara, Luz Maria Castillo, and Derric Clemmons. As the installation progressed, more people drove by and honked as sign of support. The energy was vibrant and reflective of the art that had made its way across the empty abandoned wall. Cocomocha successfully completed its first largest installation of #drivebyart and as we wrapped the evening, we saw people pulling to the side to take pictures and record. A mother and son were seen reading and admiring the messages. Friday, April 24th was a night to remember. Cocomocha studio set up a "Drivebyart" Kick Off event - a celebration in which artists, family and friends got a chance to mingle and view the art that would later be installed in Chicago's Southeast Side. The night was filled with music and pop art color. Food, familiar faces, new comers, laughs and conversation regarding the #drivebyart movement filled the halls. Our guests received gifts with our signature art pieces. The response was exactly what Cocomocha had anticipated; people from all walks of life coming together to support the ongoing effort of community hope and togetherness. Derric Clemmons, co-founder of Cocomocha Studio said, "We have all been in communities affected by violence. It doesn't matter the culture. We have all been dealing with and bleeding from the same kind of situation. We want to make everyone aware that they don't have to do a lot in order to empower a community. Just a handful of people posting color can entice and empower. We represent many different cultures. When it comes to this effort, talk to people, share the pictures, help us spread the word." We are excited to finally have our website up and running. We have been receiving supportive attention to our "Drive By" initiative. A number of artists from different communities, mostly south are showing interest in being a part of this initiative. We look forward in giving you the news of this collaborative process... There is a scheduled meeting on 3-8-15 to discuss pending objectives. The City of Chicago asks what can be done to stem negative actions and behavior, and this is our answer; an action of an artistic direction that community can feel encouraged by. We are very excited!